The taste of sour grapes is everywhere. Ever since Bangalore registered a low voter turnout last week, tongues have been wagging about the failure of the Jaago Re campaign, et cetera. Of course, we have a bone to pick there. If you think about the way our country has been run, in the last few years at least, there are far more spectacular ‘failures’ that deserve mention. We believe that the campaign is a success that is still in the making. The assignment of blame is perhaps our nation’s most absorbing pastime; there’s always someone else responsible for your problems. It felt good to use the finger. I can’t say it was the best candidate who got my vote, but in the context of the ‘big picture’ maybe it was the right choice! Thank you! Now go vote! 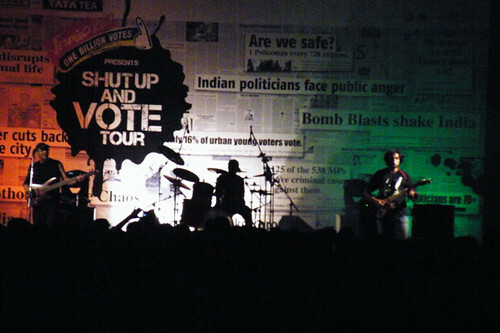 The Shut Up and Vote tour was fabulous right through the five cities. Thank you for attending the finale at Bangalore, and thank you for staying and cheering through every song, and singing along to every last word of every chorus. We love you. But now, please go and vote. We’ll leave you with some fabulous pictures taken by Shrenik Sadalgi. There are more fabulous pictures taken by one (and only) Mr. Gaurav Vaz. Facebook people: you’ll find them here. The capital. Power center with no power cuts. Karims. Gulatis. Great gigs. 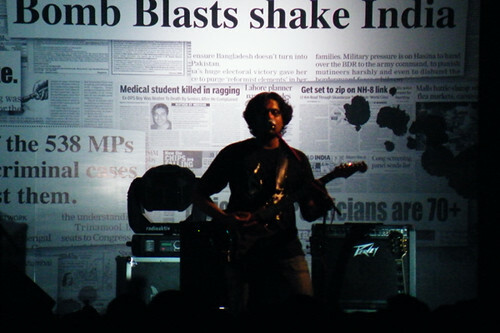 TAAQ quite infested this joint between 2006 – 2007, playing some super shows in the colleges, pubs, etc. Delhi’s always been good to us! Staying at the Tata Tea guest house, while crew (who, btw, are beginning to look more like the rockstars than us) stay at a place called (see? see?) ‘Rockland’. Manage to catch up with old pal Hebbani Raghu Rao Venkatesh (of CNN IBN Anchor fame) and his lovely wife Anu at their home in Noida. Thanks for that great dinner! Pragati Maidan is such an amazing place; last we played here must’ve been for GIR, way back in the late 90s, at the Hamsadhwani theater. Lal Chowk is also a striking location – the pics will speak for themselves. Sachin’s sound and lights were spot on, and everything came together just right. Changed the set list a bit; threw out the medley and put in Jupiter Cafe and Sanity instead. The jams were cooking! And there was a bunch of folks in front who seemed to know all the licks and lyrics… nice! Post gig Colonel’s (overpriced) Kebabs and Swagath Pomfrets later, we’re ready to move on. Must be quite a trip to do this kind of thing 200 days a year. Tonight, be there in Mumbai. We have a huge stage, full power sound and the works in terms of lighting and multimedia. And it won’t cost you anything except the train fare. Ramrao Adik Institute of Technology (RAIT) grounds (D Y Patil Academy campus), Nerul, Navi Mumbai. Happy Ugadi to all of you in Bangalore. We’re coming at ya live on Saturday evening at St Joseph’s College of Commerce Grounds. 7 pm onwards. Entry free. March 27 – Mumbai, shut up and vote! 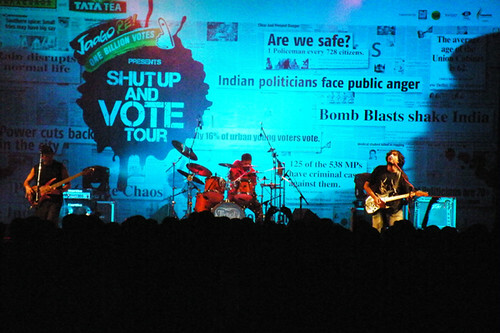 The Shut Up and Vote tour has come to Mumbai after a scintillating gig in the capital. So all you Mumbaikars and Bombayites, whichever side of the nomatophobic divide you may subscribe to, get yourselves over to Navi Mumbai. The heat. The dust. The burden of the beast… Chennai is a true ‘Look At Me’ situation. Love it! IIT OAT – the last time we played here was at least eight on nine years ago – when the Greenpeace Rainbow Warrior was docked in Chennai’s port, sounding a clarion call for ‘No More Bhopals’. Was a great gig then (will always remember this one moment: everyone in the crowd was given a candle and asked to light it at the same time… never seen so many stars in the audience like that before – it was stunning); and last night was no less. Soundcheck doesn’t quite go according to plan; there’s some conference going on and the Dean keeps ringing us to say ‘Oldein’ (travelers on B’lore buses will know that distinctive sound). But it’s all looking good… the backdrop, the lights, the stage. Chennai band Greyshack open the gig and get the crowd going with a high-energy medley. We get on after a quick AV and intro; start with Shut Up And Vote and crowd is already roaring. Nice! Saw a few Walkie-Taaqies in front singing along to Paper Puli, Look At Me, etc. One Small Love was one of the highlights; used good friend Angshuman’s Taylor acoustic (need more work on getting it to sound right, though) and played the video on the AV screen. Happy lads, kudos! Every pair of hands in the audience spontaneously came together when Rzhude drew that smile on… It was a great moment. Wrap up with Humpty Dumpty, Chameleon and finally, Motorbyckle, complete with sound effects. Good Gig! Hope we got folks to at least start thinking about the message. Make a date with us – the tour is coming to your city, or at least close!